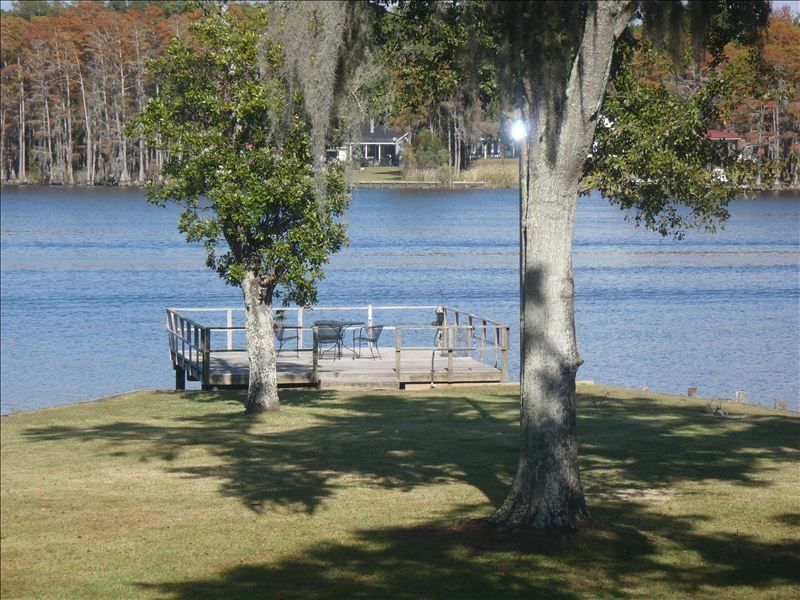 Sit back, relax and enjoy the fabulous waterfront view from almost every room in this home. Newly renovated with granite, travertine, stainless appliances, bamboo floors. This 3 bedroom 2 bath home overlooks Dog River. There is a full kitchen, breakfast room, den, formal dining room, keeping room, and bonus room with day bed. Four flat screen TV's. This is a fully furnished home including all linens, dishes, and kitchen utensils. Enjoy the Boat launch on premises. Fishing pier with green monster lights, great for catching fish at night. Outdoor patio with gas grill. Stephen Boykin 57 year old male. The waterfront living has been a way of life for us. We enjoy boating, water skiing and fishing. Waterfront restaurants are located on Dog River. Convenient to downtown Mobile, University of South Alabama, Lad Stadium and Springhill College. Fishing, boating, relaxing, breath taking views. Boat slip, Fishing pier with Monster Green lights. This place is great. So relaxing. Great amenities. Feels like home. The owners was super nice and the home was beautiful and very clean. The views was fantastic. Steve helped us unload and carry luggage upstairs, he was always checking to see if everything was ok and give him a call if we needed anything. We had some very nice rides on our trike and a lot of relaxing time at their beautiful home and on the deck over the river. In the evening you could see a lot of fish under the lights. We could never get tired of the view....Thank you Jennifer and Steve for giving us a lovely time at your home. Beautiful roomy property that is very clean and pleasant. The grounds were well maintained. Modern updates make the house very comfortable and enjoyable. We are so glad you enjoyed your stay. We would love to have you back again. The location is at the end of a private road was quiet, peaceful and comfortable.. The river offered red fish to catch and many birds to watch, yet easy access to major shopping mall and 15 minuets to downtown Mobile. The house was very clean and beds were comfortable. A fully equipped kitchen and dining room offered plenty of room for 6 people. Our host Steve, was very helpful in assisting carrying suitcases and boxes to the living area. (Houses are built 12 feet above the ground). He was always available to assist with recommendation to places to visit or where to buy food or shop. There are plenty of fishing poles and lures to try your luck. The ground level has a 2 car garage and from there walking into a play room with a TV, and a separate room with washing machine and dryer. Then you walk into the living room with another TV that is well furnished leading to the stairs to the living area of 3 bedroom,s 2 bathrooms, kitchen and dining room. Outside a patio with gas grill and a table that seats 4. A short walk to the water with a pier that has a table of 4 chairs and 2 lounge couches. At night green lights shine in the water so one can see the fish swimming. People are very friendly and the seafood everywhere was fresh from the gulf. We highly recommend this location that is relaxing, easy access to interstate, Mobile and the battleship Alabama and friendly helpful people. Thank you so much for your detailed review. We are so glad that you enjoyed your stay. Thanks for a great getaway. This property is great for a family or guys/girls vacation. There is lots of room for everyone to have their own space and the view is awesome. Cannot wait to come back. My family and I felt right at home as soon as we walked through the door of this charming home. The view from every room in the house is breathtaking. The home is beautifully furnished, yet is filled with Southern hospitality. No amenity has been overlooked. My son enjoyed night fishing from the pier where he caught a variety of fish. We truly felt pampered during our stay. We are so happy you enjoyed your stay. We welcome you back any time. Thanks!